Back in the 1980s I was a music reviewer (under the name Adelle Cooper) for three local papers in Calgary, Alberta, while also an entertainment booker (first agency to book Motley Crue in Canada!) and ex-wife of the leading concert promoter for Central Canada. While posting some of my old interviews I thought this might be the right place for a couple of them. 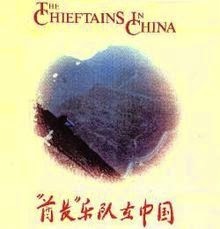 Around 1983 I interviewed The Chieftains during their concert in Calgary, shortly after they headed for China where they were the first ever Western group to play on the Great Wall, their final concert was filmed by Chinese television and broadcast to 700 million people. True to his word, sound engineer Mick O'Gorman sent me an advance copy of "The Chieftains In China" CD. Today Mick O’Gorman and his sound design company MOSCO create the sound design for all Riverdance productions . . . nice guy too!